Eric and Joel are brothers who were born and raised in West Michigan. They both started working young and running the family lawn care business both at different times. Eric earned his Bachelors Degree in Information Systems from Grand Valley State University in 2000. Joel is a graduate of the Michigan State University's Landscape Management Program. After college Eric handed over the lawn care business to his 2 brothers and worked for a decade in computer consulting serving local, regional, and international clients. When Eric found real estate he found his passion, and it shows. Starting as an investor buying, fixing up, and selling (rehabbing) single family homes, Eric quickly decided to become licensed as a REALTOR and has loved every minute of helping people with their real estate needs. Joel managed and grew Expert Landscape Management for 10 years and found a knack and a love for real estate as well. Joel began with a single rental and has also rehabbed (hands on) many properties over the years. Joel sold the lawn care business and they now work together as a real estate team. 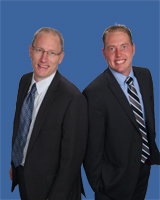 Eric was licensed in 2010 and is now an Associate Broker with RE/MAX of Grand Rapids. Joel was licensed in 2012. Team coverage means there are 2 heads in the game and you get double the coverage resulting in better service.